Located in the NW quadrant of Washington, DC, Mount Vernon Triangle is an urban neighborhood centered around the intersection of Mass Avenue, NY Avenue, K Street and 8th Street. With its more than 40 restaurants and shops and 1.7 million sf of office space, Mount Vernon Triangle is considered a textbook example of urban planning and design. The neighborhood first came to prominence after the Civil War as a streetcar community. More recently the opening of the Walter E. Washington Convention Center and the the K Street reconstruction project stretching east to west across the Triangle have contributed to the significant revitalization of the neighborhood. Read more about Mount vernon Triangle real estate. 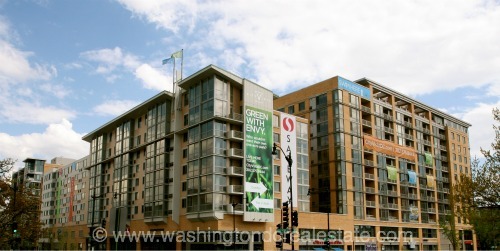 Mount Vernon Triangle is a walkable neighborhood steps from adjacent communities including NOMA, Chinatown, Penn Quarter, Shaw and Logan Circle and is served by the Mount Vernon Square/Convention Center Metro Station. With close proximity to I-395, Mount Vernon Triangle also offers easy access to North Virginia. Boundaries are New York Avenue to the north, Massachusetts Avenue, 6th Street and K Street to the south, 7th Street to the west and New Jersey Avenue to the east.